This write up stems from a user getting a malicious Word document via an email for an invoice. Running the PCAP file through Network Total, I saw that that this was tagged as Geodo/Emotet malware. Googling around for Emotet, I came across a Forcepoint article in which they did a great walk-through which you can read about here. Their article seems to cover most of what I was seeing from the network traffic perspective. Fortinet has two more articles (https://blog.fortinet.com/2017/05/03/deep-analysis-of-new-emotet-variant-part-1 and https://blog.fortinet.com/2017/05/03/deep-analysis-of-new-emotet-variant-part-2) that goes into really good detail about how this malware works. For the artifacts from this investigation, check out my Github repo here. To be honest, there is not much to this infection. This Emotet infection started off with a user getting an email with a malicious Word document attached to it. 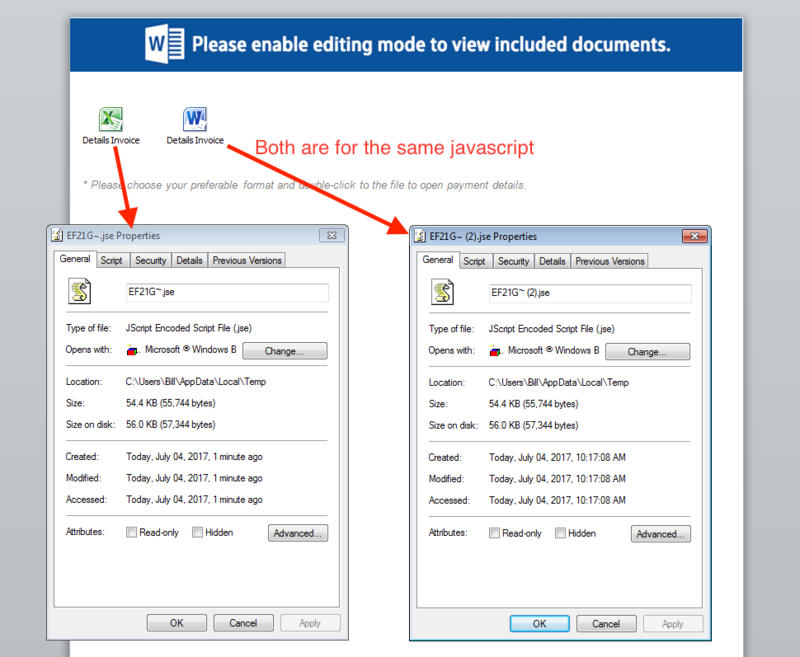 The usual thing for most attackers is to use a macro in the Word document to kick off the infection. In this example this was not the case as there was no macro embedded in the Word document, but a malicious Java script instead. I believe the file that is downloaded and executed is the “da241556.aoo” file since this is a binary file. The first check-ins with the C2 is done via one of the two “GeneralizeMspthrd.exe” processes (PIDs 1768 and 1788). Looking at the PCAP there is a call out to the IP address of 172.243.126.142 over port 443 (this is not encrypted) for a fake “404 Not Found” page which seems to fit the Emotet modus operandi along with the large Content-Length value, and unusual cookie. Along with another check-in to the IP address of 50.21.182.63 over port 443 (once again, not encrypted) with the same kind of traffic mentioned above (just different size in the content-length). With the last set of check-ins to 72.10.49.171 being much smaller in size but this time over port 8080. Persistence is obtained by creating a shortcut to the malicious binary (GeneralizeMspthrd.exe) via the Startup folder (C:\Users\%username%\AppData\Roaming\Microsoft\Windows\Start Menu\Programs\Startup). When I rebooted the system, I saw the process “GeneralizeMspthrd” spin up and check in with the IP address of “50.3.75.246” over port 443 (still not encrypted) which looks very similar with the above GET requests to port 8080. Lastly, from what I could tell in the logs from Process Monitor, the GeneralizeMspthrd processes seem to read or set values in the registry around "Internet Settings" or looking for mail clients. Looking at some of the *.tmp files that were created from the malware we can see evidence of some of what the malware was looking for. In an attempt to see if I could get some logs with my credentials in it, I did configure Outlook with a dummy account and also saved some dummy information into a site and rebooted the system to see if the GeneralizeMspthrd process would create the TMP file and also log my credentials into it. Unfortunately I was not able to get it to create a TMP file with my “dummy” credentials as the file that was created was empty. I also recorded the infection as well and posted it up at my Youtube channel. I have updated the IOC list to include the URLs found in the code.